This view shows the Moon just before it enters the cluster, which will not be visible from North America; you can watch it rise in the evening of September 19th already in the midst of the cluster. As the night goes on you'll see the stars pop back into view from behind the Moon. If you live anywhere tothe north of a line that runs across North America from roughly Queen Charlotte Island in British Columbia southeast to near Jacksonville, Florida and clearskies are forecast for Friday evening, Sept. 19, then be sure to be outside duringthe mid-evening hours and watch for the rising of the waning gibbous moon. Ifyou have binoculars or a telescope you will also see the moon moving in frontof the famous Pleiades star cluster. This event is called anoccultation, from the Latin occultatio, a hiding, or an "eclipse"of a star or planet. Put another way, it's when one celestial body — in this case, the moon — passes in front of andobscures another, here being the Pleiades. This is one in a series ofPleiades occultations that have been visible this year from various parts ofthe world. Last month, on Aug. 23, a Pleiades occultation was widely visibleacross Europe and Asia. Next month, on Oct. 17, eastern Asia and northwesternparts of North America will be favored. For about the 60 to 90minutes our natural satellite will slowly cover and uncover a number of the "Pleiads. "The brightest stars of the cluster will appear to disappear along the bright sideof the moon, reappearing later in dramatic fashion along the moon'sunilluminated limb: seemingly "popping-on" suddenly as if someonethrew a switch. Much of the western half ofthe United States will miss out on the occultation, as the moon will havealready moved past the Pleiades by the time it rises. Nonetheless, the view inbinoculars of the moon sitting just below and the lower left of the Pleiadescluster as they come up over the east-northeast horizon late on that Fridayevening should still make for an interesting sight. For most locations within theprime viewing area, the occultation will already be in progress as the moonrises and will also be positioned at a rather low altitude. Therefore, a clearand unobstructed view toward the east-northeast is strongly recommended. Prospective viewers willprobably have to wait at least a half an hour after the moon rises for it tolift sufficiently up above the haze that normally hangs close to the horizon toget a good view. Interestingly, as seen from parts of Nova Scotia and northern Newfoundland, the brightest Pleiad (Alcyone) will appear to graze the moon's lower limb.Generally speaking, the sky beginning at about 10 p.m. local time onward will provide the bestoverall view for most locations. 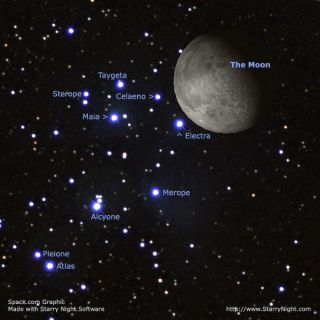 As the moon slowly climbs higher in theeast-northeast sky, it will gradually uncover more and more of the cluster. The best views will beover eastern Canada and the Northeast United States, where the rising moon shouldappear well above the horizon haze during the occultation. Places farther westwill see the moon lower and closer to the horizon. Interestingly, some Europeanobservers will be able to see the moon occult the northernmost members of thestar cluster, notably Maia and Taygeta. Keep in mind that for this part of theviewing zone, the occultation will occur on Saturday morning, September 20between about 2 and 3 hours Greenwich Time, with the moon high up in thesoutheast sky. For a maps depicting the viewingzones for the sixbrightest Pleiads, as well as a complete listing of times for dozens ofcities in North America and Europe, go to the International Occultation TimingAssociation (IOTA) web site.